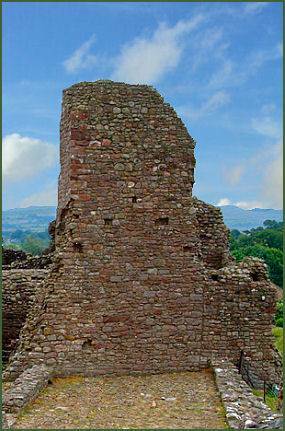 The Norman ruins of Brough Castle are situated in the village of Church Brough in Cumbria's beautiful Eden Valley. The castle was founded in 1090 upon the ruins of the Roman fort of Verterae, and was built by William Rufus, to guard the routes across the Pennines into Yorkshire and south into Westmorland and Lancashire, following the area being annexed from the Scots. It was one of the first stone castles to be built in Britain, and some of the walls display the herringbone pattern typical of Norman masonry. In 1136, both Brough and nearby Appleby Castle were captured by the Scots, but were retaken by the English in 1157. The Scots under King William the Lion again retook Brough Castle by siege, much of the castle was then burned and destroyed by the Scottish army, except for the outer walls and the base of the keep. In 1203 it was granted to Robert de Vipont by King John, major restoration works were then carried out, Vipont refortified the castle and built the gatehouse, as well as repairing the keep and curtain walls and adding the hall. In 1269, the castle, along with Brougham Castle, passed into the hands of the influential northern Clifford family, who added the tower known as Clifford's Tower. Brough Castle remained a favoured home of the Clifford family until 1521, when disaster struck when it was destroyed by a great fire during the Christmas festivities. It remained in a sad state of disrepair until 1661 when Lady Anne Clifford, the great Westmorland heiress, started restoration works on the castle and later used it as one of her homes. Following Lady Anne's death at nearby Brougham Castle in 1678, the castle was inherited by her grandson, Thomas Tufton. 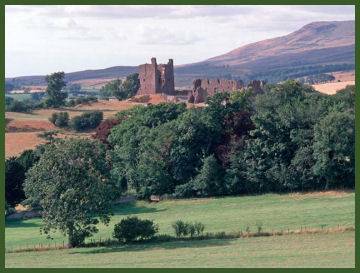 He used the castle as a source of stone to repair Appleby Castle, some eight miles away. In the early decades of the eighteenth century the castle was pillaged and its roofs, stones, lintels, staircases and pavements taken away. In 1763, part of the tower was demolished to provide stone for Brough Mill. There are two main buildings separated by a cobbled courtyard; a broken square keep which rises to four storeys, as well as Clifford's Tower. Brough Castle is now owned by English Heritage.